Pictures of India add to your experience when exploring India! It really helps to look at pictures to obtain a clearer understanding of what the people, places, art, and cultural celebrations in India are really like in India. Below is a picture of my wife Chandani wearing a traditional Indian wedding dress, known in India as a Sari. This was the sari she wore for our wedding. Women choose the color they want to wear, and the color is normally bright! As you can see, Chandani chose to wear a vibrant red as her primary color. Also below, is a picture of Chandani's intricate henna that was drawn into her hands and feet prior to our ceremony; doesn't it look amazing! The style and accessories worn by women and men in a wedding can greatly differentiate based on the region where the bride and groom come from, and their wedding budget. 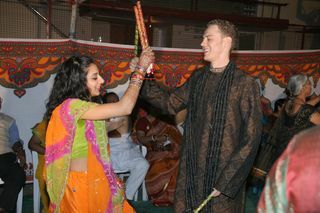 We were married in the city of Ahmedabad, in the state of Gujarat, India. In Gujarat, the sari and jewelery that Chandani wore are considered traditional. Celebrations and festivals are a huge part of the Indian culture. In the next couple of photos you can see us dancing in a traditional Garba Ceremony, and then a group of our friends and family dancing a conga-line style dance at the Garba ceremony. Garba is a celebration of dance that is customary as part of an Indian wedding, but it can also be utilized as a celebration on its own. If you check with a Hindu Temple near you, you will likely find that it holds Garba celebrations annually. 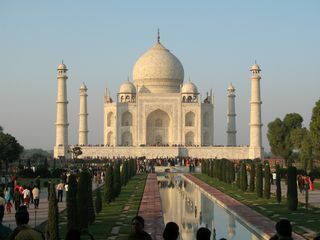 The next couple pics were shot at the world famous Taj Mahal. This was my favorite part of touring India! While India is beautiful and has so many great great places and sites to visit, the Taj Mahal remains the pride and joy of India. The first pic is of the garden as we approached the Taj, the second is of the Taj itself. This next picture from India is of us sitting at the shrine of a palace that was built by Chandani's uncle; it is located in Jaipur, in the state of Gujarat. The next one is of us standing in front of the actual temple that he designed. While touring Jaipur India, we visited the amazing Water Palace. It was so cool to see this palace because it was in the middle of a lake and can only be reached by boat! Another of my favorite pictures of India was this one of Jaivana! 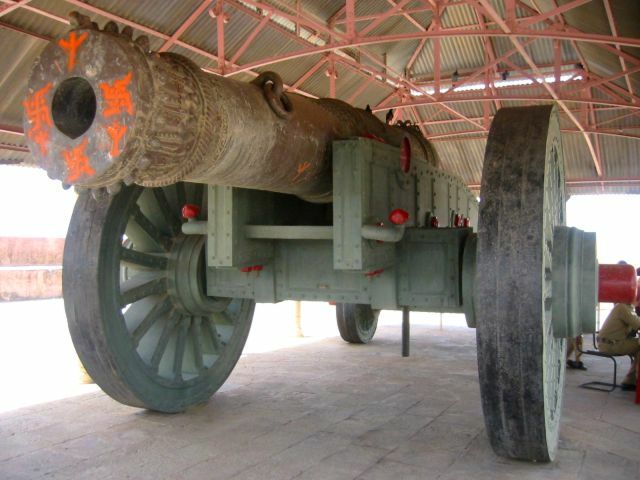 It's the world's largest cannon and is located at Jaigarh Fort in the state of Jaipur. 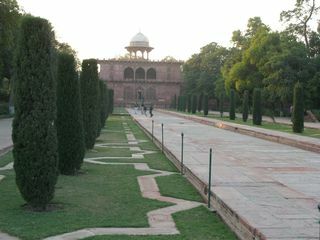 It was created in 1720, during the reign of Maharaja Sawai Jai Singh II of Jaipur. It sits on a 4 wheel carriage with front wheels that are 2.74 meters in diameter and rear wheels that are 1.37 meters. The length of the cannon's barrel is over twenty meters long and it weighs about fifty tons! Supposedly, it took four elephants to swivel this monster around for use and about 100 kg of gun powder to fire a cannon ball that weighed about 50 kg. The most exaggerated myth of the cannon was that it had a range of 40 km and that it was fired in the direction of Chaksu, where the impact was said to be so colossal that it formed a crater that has become a lake. I hope you've enjoyed these pictures of India! We'll add more soon! Make sure you join our blog and register for our free newsletter so you are kept up to date with our site additions! Leave Pictures of India to explore India from our homepage.